rench winger Georges-Kevin Nkoudou can’t envisage Burnley slipping out of the top half of the Premier League table. The 22-year-old, signed by Spurs boss Mauricio Pochettino for £11m from Marseille in 2016, had been keeping an eye on the Clarets way before his loan move last week. 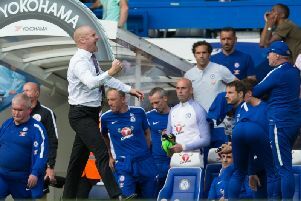 Nkoudou, who made his debut at Selhurst Park in the 1-0 defeat to Crystal Palace, witnessed Sean Dyche’s side beat reigning champions Chelsea at Stamford Bridge, with Spurs kicking their campaign off against Newcastle United at St James’s Park the following day. And he’s seen the club more than hold their own against other teams who form part of the so-called ‘big six’. “Burnley play good football,” he said. “They’re seventh in the division, just after the big six, so they’re doing well in a good league. “They’ve started good and I’ve watched them against big clubs with wins against Chelsea and they were unlucky against Liverpool at home. “They’re a very good team. I’m just finding out how the team works so I can go forward and help them win games. The former Nantes man, who represents his nation’s under-21s, had only made one appearance in the top flight this season prior to his temporary switch to Turf Moor, replacing Dele Alli late on in Tottenham’s win against AFC Bournemouth at Wembley. Nkoudou, who netted in a 3-0 win over Apoel Nicosia in the Champions League last month, had scored 10 goals in 36 appearances for former Ligue 1 champions Marseille during the 2015/16 term and he’s determined to get back playing regularly. With Manchester United next up, he said: “It’s a big game and everybody will want to play in it. Manchester United is a big team in England. Both teams will be wanting to win so it should be a good game. “I want to enjoy my football and find the situation that I’ve lost. I haven’t played a lot at Tottenham so it’s been difficult because I was playing at Marseille. “It’s different but I want to play. If the manager here sees that I’m good in training and that I can help the team on the pitch then why not? “I’ve come to Burnley to play but I need to win my place in training. I hope to train good and then if I can help the team then I’ll play.